Boost controllers for the Z31 come in many shapes and sizes but predominantly there are two categories, electronic and manual. The advantages of electronic come from a faster spool up time and more consistent boosting with less spikes, but this comes at a cost of 3-4 times the price of a manual controller. 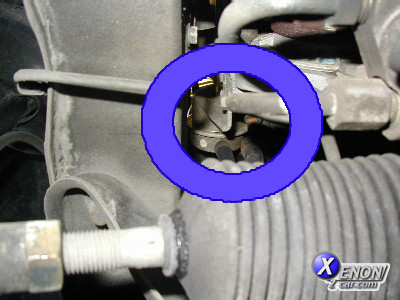 Essentially both work in the same way, by modifying the air pressure delivered to the wastegate of the turbo and hence causing it to open at a higher boost pressure than it otherwise would. Manual controllers do this by creating a restriction in the pressure feed to the waste gate, electronic controllers electronically open and close the air flow to the waste gate. 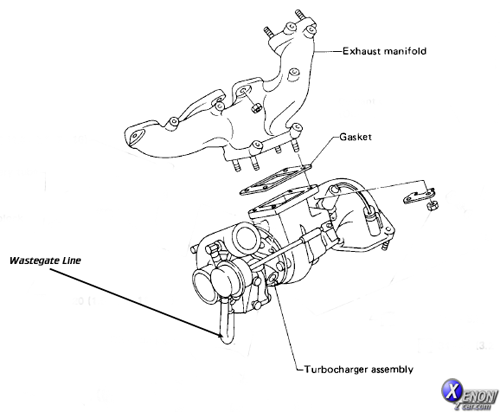 The installation of the boost regulating aspect is covered in this technical write up as it would be the same for either a manual or an automatic boost controller. We will not cover the electronic side of the installation as each manufacturer's wiring is somewhat different. If you install a boost controller you will also need to modify the pressure relief valve on the front passenger side of the intake manifold (more on this to follow) or you will not be able to boost past 8-9PSI. You probably don't want to run much more than 10-11PSI of boost for fear of detonation. Use a good boost gauge to ensure you're getting a consistent boost in the range you want and also listen closely for detonation or pinging, if you hear it turn the boost down or risk severe engine damage. Open the hood and locate the waste gate from above, it is a brass colored cylinder and is almost directly under the a/c compressor. 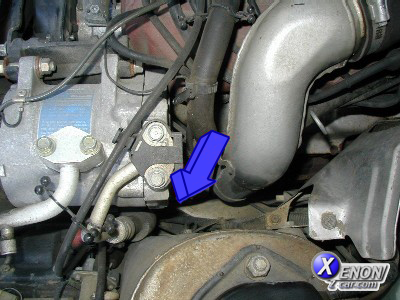 From the Factory service manual page you can see that Nissan conveniently located the waste gate hoses facing downwards. Both ends of the hose are, however, mercifully close. 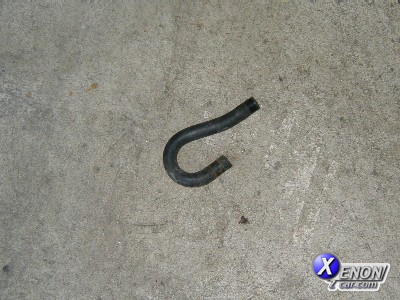 Use a pair of needle nosed pliers to loosen the hose clamps and remove the J shaped hose at the bottom of the waste gate. 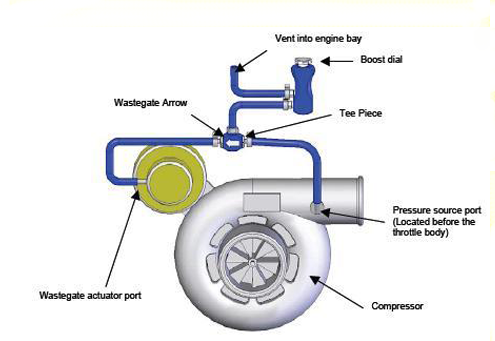 Your boost controller will have at least two connections that need to be plumbed into the waste gate one from the pressure source and one to the waste gate. Just connect these hoses where the J shaped hose was removed. Electronic controllers will also need a source of manifold pressure to determine what the boost level. I would recommend inserting a t-fitting into the vacuum hose that goes to the fuel pressure regulator and running a hose to the controller/stepping motor. When it's all up connected, start the car and listen for any boost/vacuum leaks then take for a test drive. Use a boost gauge to tune the controller to your desired boost level, never try to tune a boost controller without knowing how many PSI it is putting out. To modify the pressure relief valve on the front passenger side of the intake manifold all you have to do is stiffen the spring in it or you can remove it and add the Non turbo plug or even add an aftermarket relif valve depending on your Boost levels.